Just as a heads up: now that I will be finally have a 2 week vacation (boy do i need it) i will be releasing the next bio early. As a bonus and celebration for my temporary freedom before I am forced back into the hellish gates of a normal life, I will try (but don't promise) to feature a new song everyday after the bio. This will be extremely easy just due to the sheer volume of good songs from the next singer. And now for the queen Diva herself, Hatsune Miku. First released back in July 31, 2007, Miku history is one of one very lucky break and one huge success that has since become a staple of both the Japanese culture and of it's economy. Where as her elder siblings MEIKO and KAITO were created by Yamaha and distributed by Crypton Future Media, Miku was the very first Vocaloid produced solely by Crypton; due to this fact, and as a way of distancing her from the bad history if her siblings (checks bios above), she was made into a brand new line of Vocaloid called the Character Vocal Series, thus making her code CV01. Her voice provider is the famous voice actress Saika Fujita who since her debut in 2005 has done the voices of characters like Ymir from Attack on Titan, Mahiru Inami from Working! !, and Ritsu from Assassination Classroom (that last one is kinda funny considering that Ritsu is an A.I.). She was the very fits Vocaloid designed by the great Illustrator KEI Garou who would later go on to designed the Kagamine twins, Luka, Lily, and Galaco. The concept of her creation was to create a voice that would reach down from the future, hence her Hatsune Miku, the first sound from the future. As stated, Miku's road to success started like all other vocaloids before her. Much like her siblings and other predecessors, her initial marketing was pretty standard and not much was expected from her. Her initial sales however told otherwise. With her sales in the 12 days alone reached over 3,000 units, something that was considered unimaginable for Vocaloids at the time; for perspective, it was believed that the sale of just 1,000 units was good business. All this however, did not mean much for her popularity as Vocaloids were still very unknown. This all changed in in September 4, 2007 when the great producer Otomania released Ievan Polkka to the world. The video was an immediate success and led to many producers in Nico Nico Douga to quickly begin on their own works. IN September 20, 2007 Miku Miku ni Shinji Ageru♪ (Shinji Yan yo) by ika was released and became the second great footnote in Miku's history as being the very first Vocaloid song ever to reach over 1,000,000 views on Nico Nico Douga. 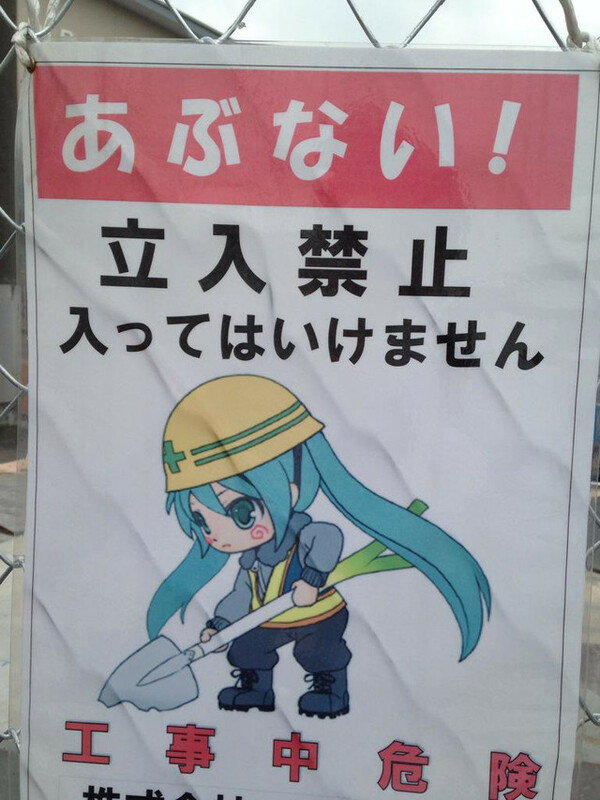 Since that time, Miku has seen an explosion in popularity, gaining favor both at home and overseas. In 2014, a research lead Nomura Research Institute found that sales of Hatsune Miku branded goods alone made up an economic sale of ¥10,000,000,000 (about $88,335,000 adjusted for inflation) since 2007, making Miku an increasingly leading brand in the Japanese economy, Since her great success, the popularity of Vocaloids overall have grown greatly and her influence has reached over future Vocaloid, even those not from Crypton Future Media. With her great popularity, also came many attributes that although not canon according to Crypton Future Media, are widely accepted by the fandom. Her character item is of course the Negi. Although that was a bit of a fight during item meme wars, her blue-green striped pantsus were decided on very democratically (do not kill the messenger). As for her personality, although she is considered the perfect blank slate for producers to make her out to be whatever they want her to, outside of it the fandom normally sees her as one who does everything for the chance to sing. She is though of being one to push through any labor to sing, even accepting road work signs with her on it merely as her either making cash for her next gig or building the stage herself. ALthough there is much more we can say about her and her road to success, lets just end it here before I have to write an entire book. Look forward to the next two weeks full of great Miku songs until I'm forced back and chained into labor. Later. How could we ever start talking about Miku large repertoire of songs without starting with the famous Otomania Cover of Ievan Polkka. First released in 2007 in nico nico douga, the song and video became an instant success and begin the craze of Vocaloid we know today. The song itself was a cover of the 1995 Loituma quartet version of the classic Finnish song. The video, depicting a chibified version of Miku spinning a Negi Onion, was inspired by a 2006 Flash animated video of Orihime from the anime Bleach, spinning a leek to the the Loituma Ievan Polkka song. The Miku video became the catalyst for the ultimate decision during the item wars to give MIku the Negi Onion as her character item. The success of the song inspired various composers to make covers of the Otomania version with other Vocaloid including Rin, Len, Luka and various others as arias, duos, and groups. In 2009, the Hatsune Miku -Project DIVA- , the first in a long line of games, not only featured this song as part of it's roster but also introduced the famous Ievan Polkka dance. This dance again inspired other artists to make covers of this dance with other Vocaloids, some of which were featured in later Hatsune Miku games. And now for Miku's first true breakout, Miku Miku ni Shinji Ageru by ika. One of the earliest songs for Miku and one of the earliest successes, It was the very first Vocaloid song ever to reach the 1 Million view mark on Nico Nico Douga and is still to this day the most popular with more than 13 Million views. The song is a denpa style song, one which is very nonsensensicle and is hard even for most native speakers to get the point of the lyrics. In a very rough translation, the song is essentially a introduction from Miku. She comes in explaining she is a marvel of science and wants you to hurry up and install her on your PC so she could hurry up and mesmerize you with her music. The song is pretty appropriate for being one of the first considering the subject matter. Tune in tomorrow for another song; I will continue adding more and more until my vacation is over. Welcome back again to the two weeks of Miku. After hitting the randomizer button on my phone, here is Paranoia Mezame-P. Available from the EXIT TUNES PRESENTS Vocalosensation feat.Hatsune MIku album from CD Japan. Released in March 13, 2012 with the video by Shinri Hizumi, is another instant favorite reaching over 10,000 views on Nico Nico Douga within 2 days of its upload date. Mezame-P's most popular work, this song uses the Dark Append version of Miku and for its subject matter it fits quiet well. There are a few interpretations on what the song is about and all of them are just as dark as the append version would entell. One interpretation of it is the singer being sorrowful and angry with the passing of her beloved, wishing to die and be with them again as mentioned in the lines sora e to ai ni yukou (Shall I go meet you in the sky?) and sayounara me o tojitara (Farewell, now I just have to close my eyes…). This is perhaps my favorite interpretation of the song as it not only makes the most sense when taking all the lyrics in consideration, but I prefer it over the sadder interpretation of this being an abusive love that the singer is unable to just end. Like so many Vocaloid songs, this is one that to non Japanese speakers may sound like a fun song, but when you dive into it it is just as dark as dark gets. Hope you enjoy that depressing little song, expect so many more like it to appear again here. I'll see you all tomorrow in the next installment. Welcome back to another installment of 2 weeks of MIku. Once again my Randomizer has graced us with another hit. Today we have Netgame Haijin Sprechchor (ONLINE GAME ADDICTS SPRECHCHOR) by Satsuki ga Tenkomori. Available now in the Digital Trax presents VOCALO POPS BEST feat. Hatsune Miku album ( highly recommend it) from CD Japan. Released in October 1, 2010 it is Satsuki ga Tenkomori's most popular title. as its official english title would entitle, The MMORPG ADDICT'S ANTHEM, the song is all about being addicted to Online games, most specifically MMORPGS. The lyrics tell of what can best be describe as a hikikomori playing an MMORPG, feeling melancholy about having to play with so many Noobs, being in a dark room all day, but still preferring to continue playing than to go outside. Anyone that has ever been on a game binge would know the feeling. It has been featured in the -Project DIVA- f. game where the character would dance around in the lobby of the MMORPG Phantasy Star Online 2. Thank you once again for joining in me procrastination of my actual life. See you tomorrow for another random installment of 2 week of Miku. No Randomizer this time, now its personal. Welcome back to 2 weeks of Miku. This time we have one of my favorite from one of my absolute favorite producers. This is Miku Miku☆Summer Night Fantasy by samfree. Unfortunately it is not legally available and was only released on the event only Album Fever!, which is sad considering it is one of the best albums out there. Part of the Fever line of songs from samfree, this is Miku's own special song. samfree had, before he passed away, a knack for upbeat club type songs which he compiled into the Fever album. Not much to say about this song since the lyrics are don't have any deep meaning but it is still a great song. Tune in tomorrow for another round of Miku. First released in March 22, 2010 it is one of ChouchouP's best works and one of my favorite (as all the songs in here are. I would never recommend something I myself don;t enjoy). Unlike all the other Miku songs thus far, this one has a subject matter we haven't touched on for her. The song, in a sense, is basically about the singer being lustful, to the point where her partner is unable to keep up. She takes him on, not letting him go until she is finally satisfied at the end of the song. The songs catchy tune made it a favorite for for other producers, leading to several covers of it with various other Vocaloids and Utaite. It was featured in several Omnibus albums and was a song in Project DIVA-F Complete Collection (from where the video originated from). I hope you enjoyed today's song and see you again tomorrow for another. I feel lazy today so this time I will just import a song from the old blog. I did promise I will do it eventually so its fine by me. This is Ward Room 305 Hachi featuring Hatsune Miku. Available from the Official Orange feat.Hatsune MIku album from CD Japan. The song itself isn't particularly very popular even in Japan and it is a very weird song. The song itself is basically the broken thoughts of a crazed patient in an asylum and how it perceives the while experiences within it's walls. The song is super creepy and is actually a cover of even creepier song by Hachi called In a Rainy Town, Balloons Dance with Devils. Some speculation suggests that the two songs are like a story with the first (in a Rainy Town) being the tory of the patient losing their mind in the outside world and the cover being their story once they were caught and forced into the asylum. The lyrics also point to this as the first one talks about a weird and creepy thoughts and world perception of the narrator and the second song's lyrics being completely about the happenings inside the asylum. Welcome back to 2 weeks of Miku. Today's Randomizer pick is Rolling Girl by wowaka. For those who were part of the old blog, you will be familiar with this one as it was featured there and it is just that good. Just as a heads up for those who didn't read it before, despite how cheery it sounds, this is perhaps one of the darkness songs you will hear as its subject matter is so dark and true to life, enjoy. The song is Now available from iTunes. The song was released in 2010, and then a PV (shown above)a month later. The tile of the song,(and much of the lyrics) is a play on words from Lonely Girl, stemming the fact that the Japanese have a loose pronunciation of their R's and L's. The song and PV depict a girl, played by Miku, who is bullied and abused. She is cornered into a lonely and sad state and tries her best to keep herself from breaking. Each time she says mou ikkai(one more time) it is her trying to motivate herself and keep going.The darkest part of the song is in the fact that she creates a separate persona for herself in the form of a male character. It is this character that represents her ultimate limit. It represent the part of her that wants to give up and end it. Each time she says "mou ii kai?" ((How about now?) it her her other self asking if it is alright to end it and her broken self saying she can still keep going. At the end of the song, the lyrics "sorosoro kimi mo tsukaretarou, ne. iki o yameru no, ima.iki o yameru no, ima (You must be exhausted too, right?” Stop breathing, now.) signafices the characters acceptances of her depressions and finally ends it by committing suicide. I swear when I first listened to this song, I fell in love. I loved the rhythm of the song and when I went online to find the lyrics of the song to sing along with it, I found something I didn't expect. This is hands down one of the single most depressing songs in Miku's list and still to this day a favorite. It' best not to think too hard when listening to it, lest you fall into a hole that would be hard to get out of.